Lady Antrobus of Amesbury Abbey captured the above stunning image on 12 September 1872, which is taken from her personal scrapbook. The location is below Beacon Hill on Salisbury Plain, which is now Bulford camp. On first glancing at the image, my initial thoughts were of the American civil war, which ended seven years earlier on 9 May 1865. It captures the final march past and review after British Army exercises involving not less than 40,000 men in southern Wiltshire and Dorset in the preceding days. Two armies were assembled, one at Blandford, representing an invading force, and another on August 31 at Pewsey. The two sides comprised 12 cavalry regiments, 14 artillery batteries and 24 infantry battalions, and the manoeuvres were scheduled to continue for nine days. In addition to training men to react to modern weaponry, the British Army was involved in a new style of military manoeuvres on Salisbury Plain imitating similar Prussian army activities. 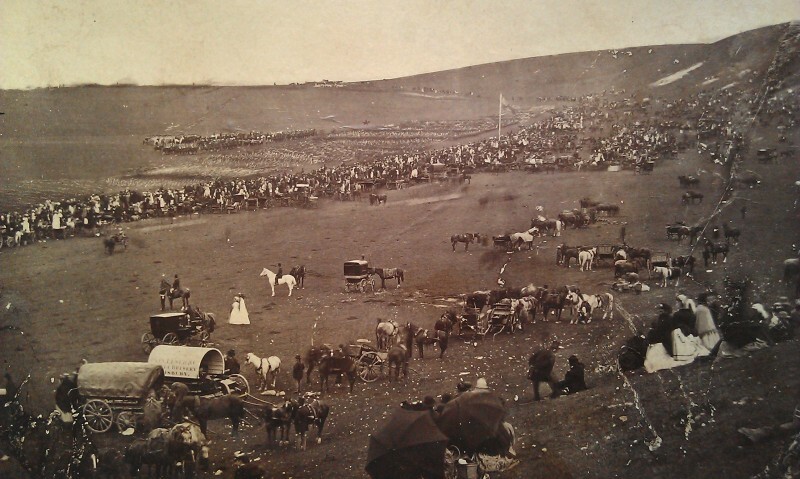 The foreground appears to be the area Lady Antrobus, her family, and friends were occupying to view the occasion, and the main crowd is gathered in the valley to view the soldiers, horses and equipment marching past. Due to the long exposure required for the photograph, much of the detail of the soldiers is not clear. The man on the white horse in a top hat commands the central focus of the foreground, with the two girls in their ‘Sunday best’ to his left. A white covered brewery wagon to the left from Amesbury provides essential refreshment for the day. Horses, as witnessed in this photograph, featured prominently in these pre-motorised times. Due to developing technology at this time in the 19th century, the army was becoming more mechanised, leading to greater mobility, which created new challenges. In 1872 it lacked its own facilities and land to train and exercise effectively with the fast evolving weapons of war. During this exercise it ranged generally across the countryside, the main purpose of which was logistical. Inevitably, this caused a problem for the landowners of the time, whose land was damaged by the serious compaction caused by thousands of soldiers, horses and associated military equipment. The tenant farmer of Redhouse Farm, George Blake, who farmed the above land, had the grassland grazing ruined for his sheep on the occasion above. A description of the buildup to this massive mobilisation witnessed from Hungerford is here. The military subsequently purchased 41,000 acres of Salisbury Plain in 1898 at £10 per acre. The training area extended roughly from Shrewton to Bulford in the south to West Lavington and Everleigh in the north. Today’s training area is 92,000 acres. The land was used mainly for cavalry, artillery and range firing, supplementing the training area at Aldershot. Ominously, the purchase was prompted by the necessity for target practice and training with rifles, which by that time were able to fire in excess of 1000 yards. Little did Lady Antrobus know on the day she took this photograph that she was witnessing a fragment of a relentless chain of events that were underway and would ultimately lead to the maelstrom of World War One. It claimed her only beloved child, Lt. Edmund Antrobus, Grenadier Guards, who was killed in action on 24 October 1914 and, personally, my own great-grandfather Percy Edward Kinsley of the 2nd battalion Royal Irish Regiment, who was killed in action in France on 3 September 1916. 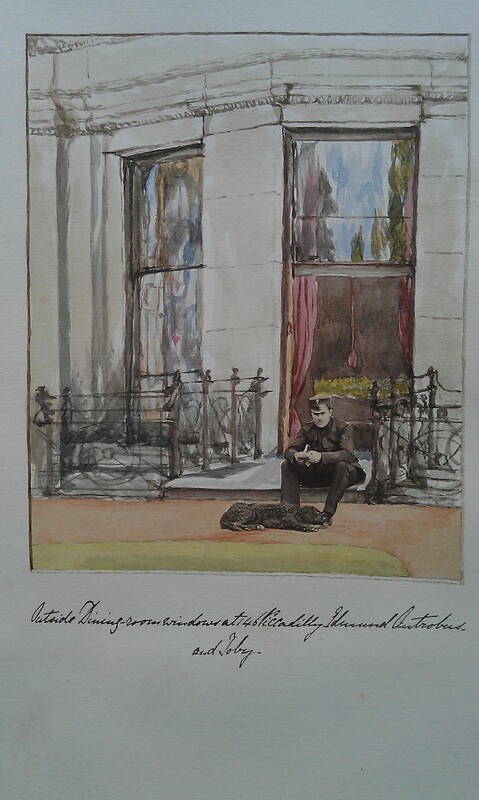 Below is another watercolour and photo montage created by Lady Antrobus and taken from her scrapbook of Edmund, with his dog, Toby. Oh! Jesus Christ! I’m hit,’ he said; and died. The Bullets chirped-In vain, vain, vain! And the splinters spat, and tittered. Till slowly lowered, his whole faced kissed the mud. I have chosen the above as a dedication to my great-grandfather, as these words of Wilfred Owen perhaps capture what may have been his last.